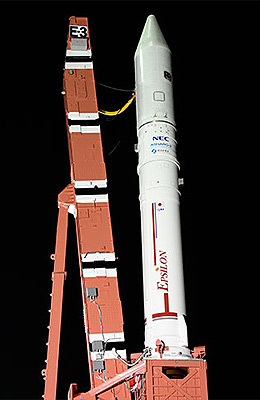 The Epsilon (designated Advanced Solid Rocket during development) is the replacement for the M-5 rocket. 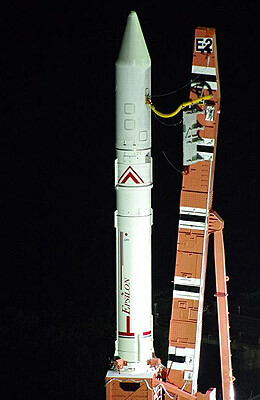 The initial configuration, Epsilon, featured the SRB-A3 Booster of the H-2A as first stage and the M-34c and KM-V2b stages of M-5 heritage as second and third stages. Two SMSJ ( Solid Motor Side Jet) are added to the SRB-A motor for roll control. Optionally, a liquid fueled fourth stage (CLPS, Compact Liquid Propulsion Stage) can be carried. It will be capable to put about 1200 kg into low earth orbit (3 stage) or 450 kg into a sun synchronous orbit (4 stage). 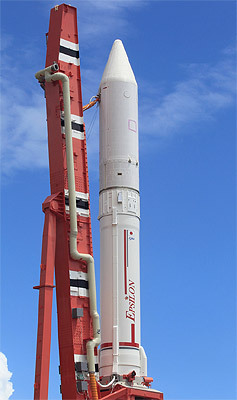 The focus in development will be on streamlining the launch procedures and reducing the costs. Beginning with the second flight, it was replaced by the improved Epsilon (2) (Enhanced Epsilon), which features the larger M-35 stage 2 and a modified stage 3 KM-V2c, which both will have non-extending nozzles to improve performance and to simplify the vehicle. The new rocket had its maiden flight in 2013.